Perhaps you’re travelling to Lisbon for work and only have a short time to see the city – maybe a few hours in the morning before a conference, or some time in the evening after a meeting. Or maybe you have a layover there, leaving you with a glorious afternoon to explore. Whatever it is, even the smallest glimpse of Lisbon is worth it, so we’ve broken down some sights you can easily fit around your schedule. If you have an hour to spare in Lisbon, pop down to the colourful Mercado da Ribeira and sample some of Lisbon’s finest local delicacies. Located opposite the Cais do Sodre train station, it’s within each reach of the city’s hub. This 19th-century market is packed full of fresh-off-the-boat fish and newly harvested vegetables – there’s even a custard tart factory too. 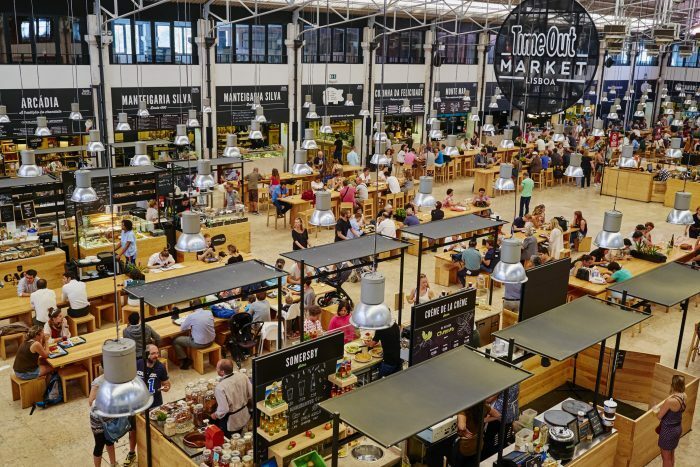 Once you’ve picked up some goodies, visit the indoor food court that Time Out magazine opened in 2014 – a street-food paradise, with 40 stalls showcasing Lisbon’s top chefs. Snack on Portuguese favourites like pastéis de nata and leitão (suckling pig), or explore fusion cuisine at one of the burger, sushi and pizza bars. 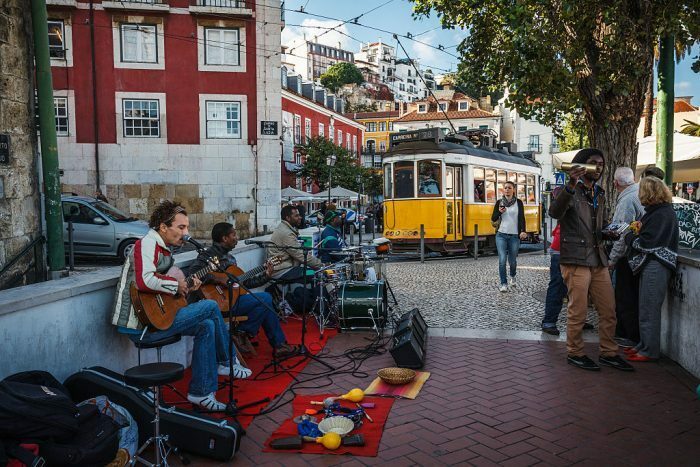 To hear Lisbon’s mournful and melancholy fado, wander around the cobbled Alfama neighbourhood, just south-east of Lisbon centre, and settle into a traditional bar. This evocative folk music has been stirring audiences since the early 1800s. Black-clad singers belt out haunting songs about lovers lost at sea while 12-string guitars keep time. Most of the casual bars in the ramshackle Alfama neighbourhood have fado shows in the evening so slip inside, order a bowl of caldo verde soup, and join the locals as they sing along. The abandoned fabric factories underneath the Ponte 25 de Abril Bridge have found a new lease of life thanks to the creativity of the urban population. Art galleries, vintage boutiques, yoga studios, hipster bars and charming restaurants have sprung up to form a mini-city. One of the standouts is the bookstore, Ler Devagar. It’s often referred to as the ​‘coolest’ bookstore in Lisbon – its books are stacked up to the ceiling and it’s filled with unusual artwork. Ler Devagar is also set inside an old print factory and even has a cake shop, and bar, too. Visit the LX Factory on a Sunday to hunt for treasures at the flea market. 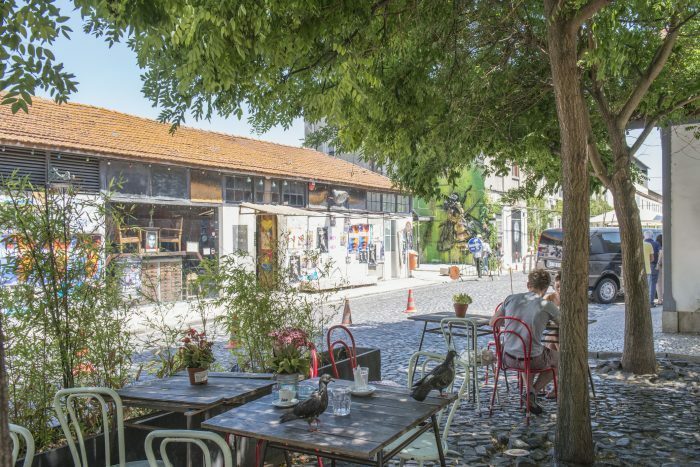 If you have a couple of hours to spare in Lisbon, hop on the metro to the Baixo-Chiado Station and take a quick trip over to the Carmo Convent gothic ruins for a slice of history. 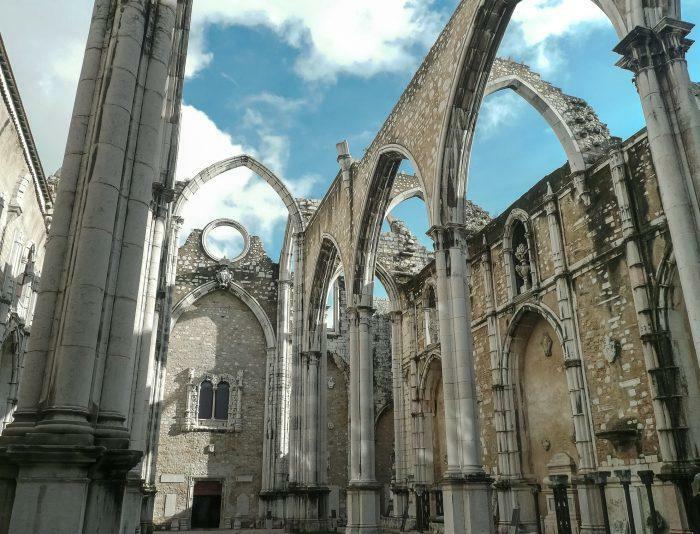 It was once the largest church in Lisbon but left in ruins after the 1755 earthquake. With its dominating arches, lofty pillars and roofless nave, it’s an enchanting sight to behold. Make sure to visit the miniature archaeological museum on site too – it contains a collection of tombs, colourful mosaics, South American mummies and coins dating back to the 13th century. As you make your way back to the city centre, glance back to take in the striking silhouette against the rose-gold skyline. If you’ve got an evening to spare in Lisbon, consider spending it in the Bairro Alto. This sleepy neighbourhood becomes the go-to spot as night falls. 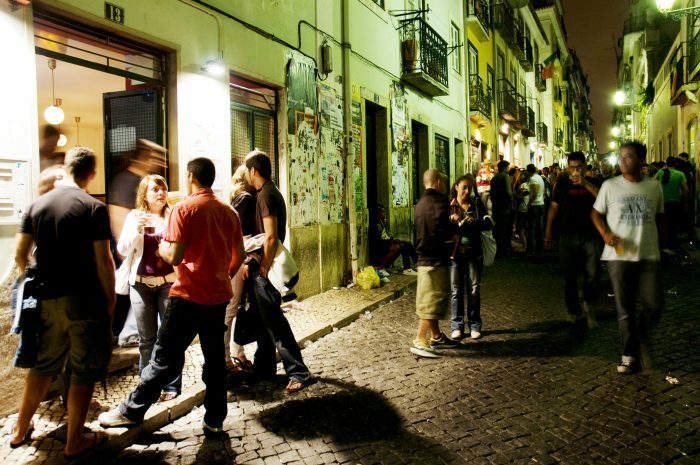 Head for Rua da Atalaia or Rua do Diário de Noticias and join the crowds of hipsters, elderly couples and party-goers. Bars range from tiny hole-in-the-walls where drinks are poured into plastic cups and revellers spill out onto the streets, to sleek wine bars set inside old buildings with cloistered ceilings. Try Insólito for magnificent views of Lisbon or Hot Clube Portugal if you fancy hearing some jazz. From cosy dens showing vintage movies, to reggae bars with live music, there’s something for every taste. Elegant Belém is a small, historic suburb a short tram ride away from Lisbon’s city centre. 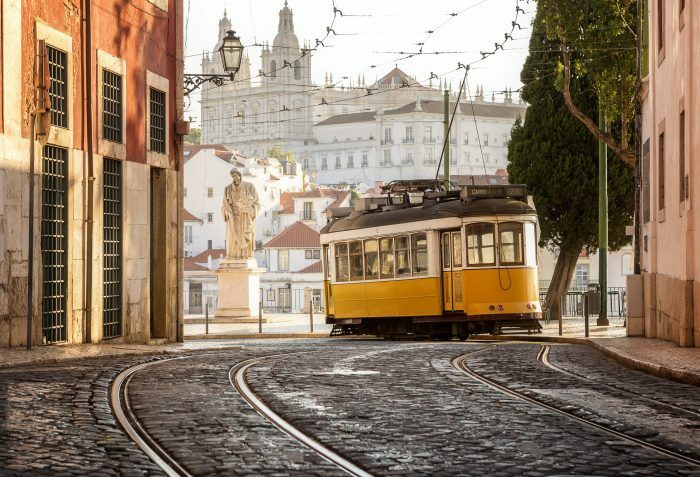 Just take tram 15 or 127 from Figueira Square and jump off at the Jeronimos Monastery. The area is covered in rare Manueline – Portugal’s own gothic-style architecture – historical monuments and contemporary art exhibitions. Sights to explore include the Maritime Museum and the Torre de Belem, Jerónimos Monastery. You can take a leisurely riverside stroll along the Tagus, if you feel energetic.